I have glitter covering me, but I don't care, because I am so excited about this! I have added some bling to otherwise ordinary wooden clothespins with vintage silver German glass glitter! These will take on a tarnished look over time, simply fabulous! 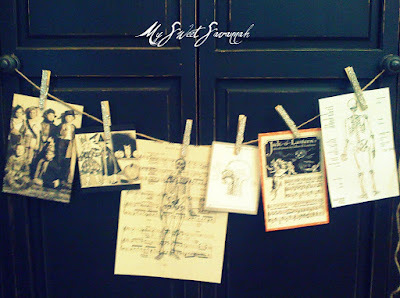 Use them as I did to hang vintage Halloween images. Or use them to hang old black and white family photos. 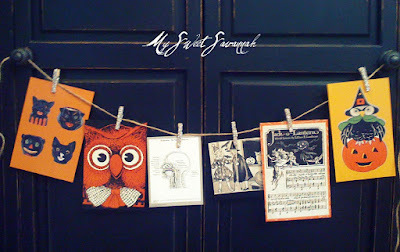 Display your Christmas cards.... You name it! Available in 2 sizes in my etsy shop! Each bag will come to you in a neat little bag with vintage shreds and a ribbon! I LOVE it! 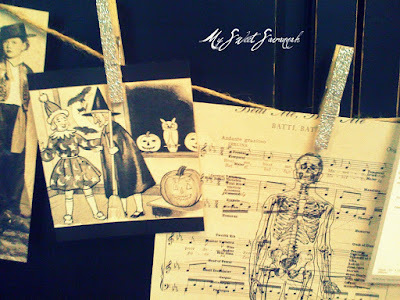 I love the idea of it for Halloween, I am working on something similar to hang in my new craft room but nowhere near as cute as this! Fabulous! Very cute! 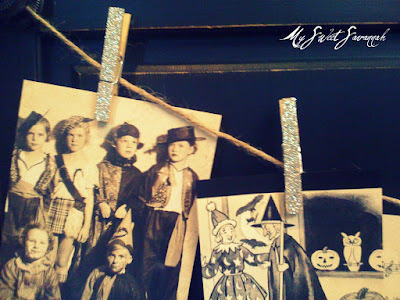 Ijust love vintage glass glitter! I have several different colors and I put it on everything that is lacking in bling department!!! Great idea! Love the cards! Great ideal! 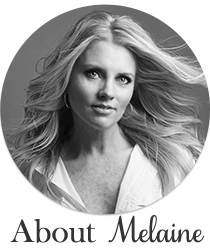 Are the photos in your heading Your home? I love them. Clothes pins are my favorite and mix it with German Glass Glitter...amazingly fun. i love these! It makes me soooooooooo excited for Halloween!